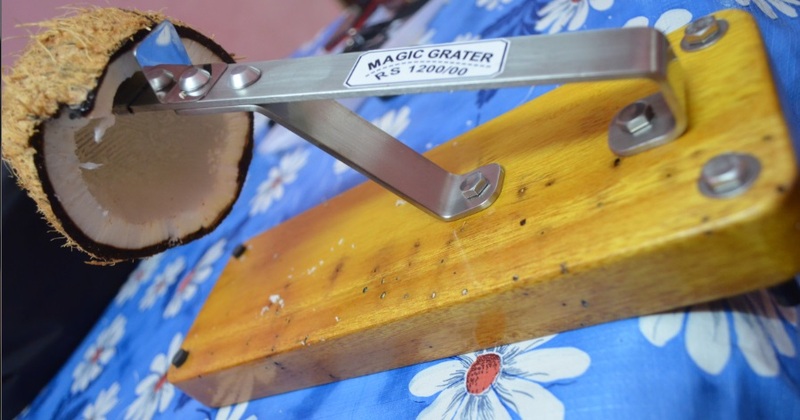 How easy it is to grate coconut from its shell? Some of us use the powered tools like the one comes in grinders while many others use hand based tools. I had written about a simple utility developed by Upadhya brothers here. It was a plastic unit and there were also few basic versions of steel and wood based graters. 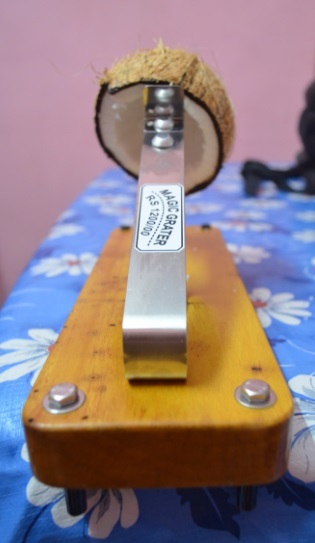 Recently Mr Venkataramana Upadhya has improvised on the coconut grater and below is how it looks. It now gets a strong wooden base, a much hardened grater unit and the support nails get a plastic cover. Previous model had two legs, a shorter one and a bigger one. This one gets one leg only.Grater should be held firmly against the table using your thighs or a hand and grate the coconut against the blades using the other hand. 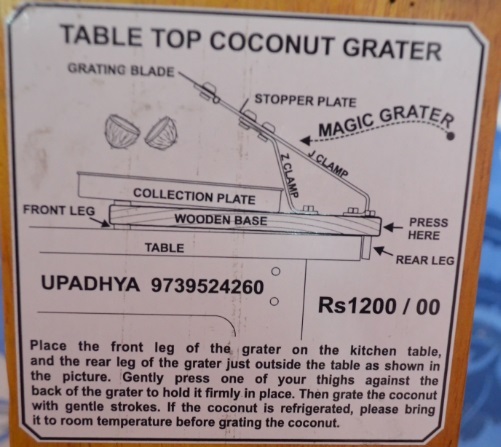 If this table top coconut grater interests you, you can check with Mr Upadhya on the numbers given in the picture. Picture says MRP of Rs 1200, but I guess that is final retail price. You might get it for little less if you get it directly from the maker. If you get it by parcel you will have some fittings to do- tie the grater to the wooden base using screw and spanner provided. Best wishes to his innovations and if you feel above grater can make life a little easier in the kitchen, go get one. Er...I fail to see what makes this worth 1200 bucks! You can find a grater with a vacuum base and a manual rotating blade for much cheaper. Not to mention the traditional tool that looks like a skateboard with a combo cut+grate blade is much more stable than this will ever be.